Why bother with direct response copywriting? Why bother hiring a direct response copywriter? It's only a very general estimate but I believe that 96% of print and web copy is fluff. There's a bit less fluff copy on TV and radio. How do I define 'fluff' copy? I'm not saying that fluff copy is bad, or grammatically poor, or poorly written. Quite the contrary. I read fluff copy that's elegant and crisp. But it's explanatory. The only result I can sense is for the reader to think, "OH! How nice! That company/product/service is GREAT!" If you can tell me what the "Primacy of a Brand" represents then I'm all ears. Looks great. Reads well. But there's not even a call to action. Our brothers and sisters in the world of branding, who worship fluff and give each other prizes for the best fluff, are generally terrified of direct response. Why? Here's the official answer: they fear that consumers will equate a product or service with an infomercial or junk mail culture. The real reason is quite different: branding agencies want to charge massive fees for pretty ads and 'award-winning creative' WITHOUT the pressure of having to show actual results and ROI. Look...if the company hiring the agency is happy with that type of relationship, so be it. Why bother with direct response copywriting? Why bother hiring a direct response copywriter? There's an easy answer to both questions: RESULTS. If you want to benefit from techniques PROVEN to maximize response, then you need to hire a direct response copywriter. Write response driven copy to...GET A RESPONSE! Provide some strategic direction...if necessary. Write successfully across different media and platforms. Provide complementary content to steer readers toward transactional pages. Rewrite if the response is poor. Make sure you have all the vital direct marketing elements in place (offer, guarantee, etc.). Constantly strive for better results. Have only one goal...help the client increase revenue. Write derisory blogs about fluff! Here's the truth about direct response copywriting--the truth the merchants of branding don't want you to know...you CAN maintain your brand integrity AND use direct response copywriting techniques. The perfect example is GoDaddy.com: their TV ads drive you to their website. The website has an offer. There's some direct response copy on the site and the goal of this copy is to UPSELL. The $12.99 sale becomes a $100 sale in just a few quick clicks. The company is successful enough to spend millions on advertising and sponsor a race car. And it's not obnoxious. I Love All of You in Branding. Really! One of the core characteristics of my brothers and sisters in direct response: a desire to bash all of you in branding and 'image' advertising. It's a type of reverse snobbery, perhaps, and I won't indulge myself. If you're an agency type and you're afraid of direct response copywriters and their lust for response, don't be. As a direct response copywriter, I want to help you create tangible results for your clients--results your clients will love. And when you show your client a positive ROI, they will continue to hire you. 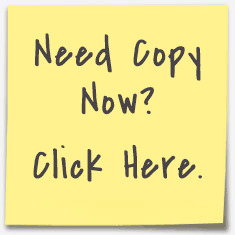 Do you want a copywriter who will help you get tangible results (aka MONEY)? Do you want a copywriter who will produce 'fluff' that will make everyone look good and perhaps win a couple of awards? Perhaps you can enlighten me as to why advertising agencies, marketing gurus, and consultants shun direct marketing and populate their websites and brochures with 'fluff' and 'brancentric' gibberish in lieu of direct response copy--copy written to generate leads and revenue. Leave a comment below!